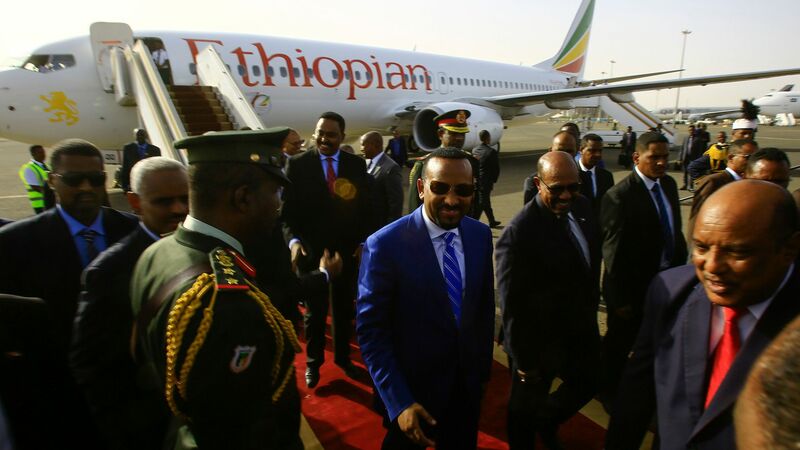 Ethiopian Prime Minister Abiy Ahmed arrives in Khartoum for a visit to Sudan on May 2, 2018. Ethiopian Airlines is one of the companies that is likely to spur investor interest. Photo: Ashraf Shazly/AFP via Getty Images. Ethiopia's government announced plans last week to allow private-sector participation in key economic areas that have long operated as government monopolies, including energy, telecommunications and aviation. The announcement comes two months into Prime Minister Abiy Ahmed’s term, and may be his first clear signal of opening the economy. Why it matters: With public infrastructure investment generating almost 10% annual GDP growth over the last decade, Ethiopia is one of the fastest-growing countries in the world. However, Ethiopia has also accumulated large amounts of debt, and businesses are eager for foreign exchange. Why now: It's estimated that Ethiopia’s foreign reserves cover just over a month’s worth of imports, leading to what many businesses feel is the worst foreign-exchange shortage in recent memory. Without greater liquidity, it's difficult to create the 3 million jobs per year needed to absorb the young people entering the labor market. Nearly 40% of Ethiopians are under the age of 15 and high youth unemployment has contributed to political unrest. The opportunity: A largely untapped and under-served market, Ethiopia is Africa’s second-most populous nation after Nigeria, with a population over 100 million. South African telecommunication groups MTN and Vodacom expressed excitement over the announcement, and Ethiopian Airlines, long the most profitable airline in the region, will surely spur external interest. The government will remain majority stakeholders in energy, telecommunications and aviation, but other sectors — including the railway, sugar and hotel industries — will be open to full private-sector ownership. The bottom line: While Ethiopia will continue following its Asian-inspired state-driven growth model, the decision to gradually open the economy to privatization will provide new opportunities for foreign investors and potentially heralds a larger economic policy shift under Ahmed's government. Aubrey Hruby is a nonresident senior fellow in the Atlantic Council's Africa Center.